Did you know that every state has a signature dessert? I honestly never even really thought about it. I saw an article somewhere one day that had was talking about all of these great desserts, so obviously we needed to investigate that. After-all, who doesn’t like dessert! I found this recipe for Alabama’s famous Lane Cake. Give it a shot, I know we are! A brief history of Alabama’s classic Lane Cake. 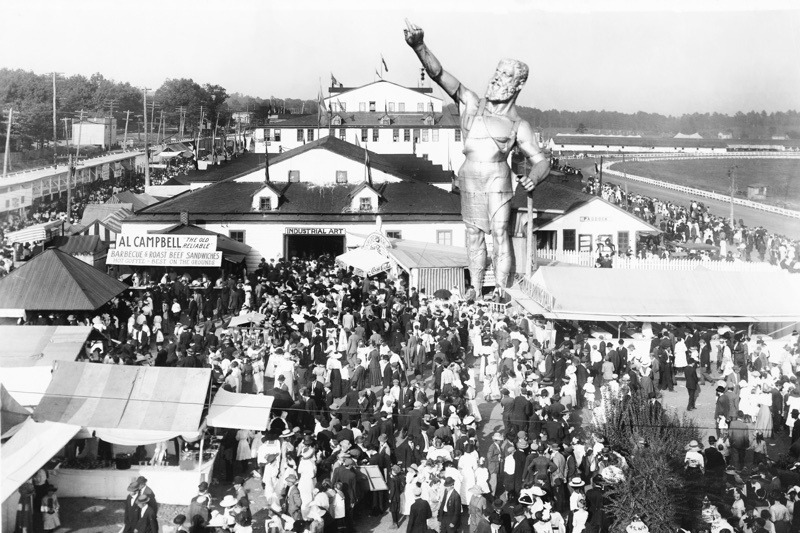 Lane Cake is the creation of Emma Rylander Lane of Clayton, Ala., who published the recipe in her 1898 cookbook, “A Few Good Things to Eat.” Emma originally called it “Prize Cake” because it had won her first prize in the fair. Lane Cake has a reputation as being difficult to make. When the recipe originated, there were no electric mixers, even hand-crank eggbeaters were not available in every home, which meant a lot of elbow grease went into beating egg whites to frothy soft peaks. Ovens were wood-fired with no thermostat, making it difficult to bake cake period. Much less a white cake. The pecans, raisins and coconut had to be chopped by hand or, put through a hand crank meat grinder (get your workout in when you make this treasure). Now filling ingredients can be chopped in an electric food processor today. We also have refrigeration which allows one to produce a stiff filling, making it easy to build an orderly multi-layer cake, rather than a sticky, gooey mess of a dessert. Even with all of our modern conveniences, making a traditional Lane cake is still quite an undertaking. This is not a fast cake, it’s not a bake and take cake, it’s a special occasion cake for very special people. But, why? The Lane Cake needs to “marinate” for several days before it is sliced and eaten. Because of this, many Southern families have stories of “the best cake ever tasted”. Good things come to those who wait, right?! 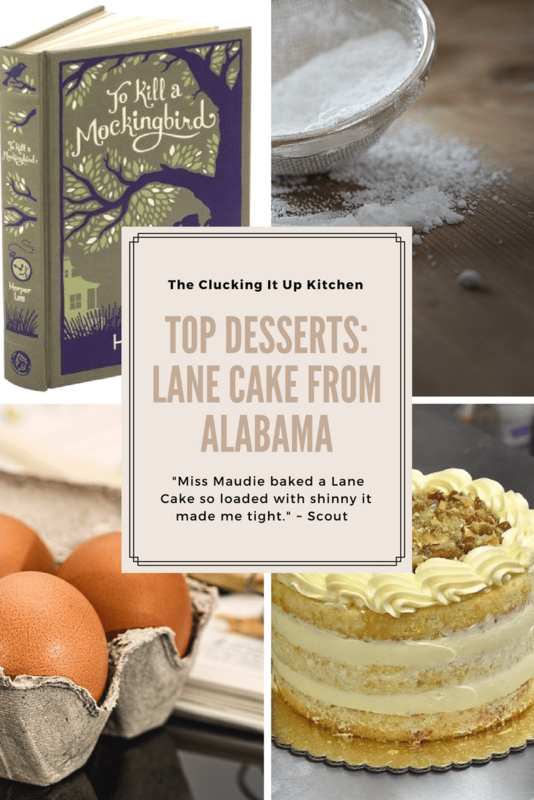 Alabama Lane Cake is a feature in Harper Lee’s classic tale To Kill A Mockingbird. A Lane cake is given as a welcome gift to Aunt Alexandra by Miss Maudie Atkinson. 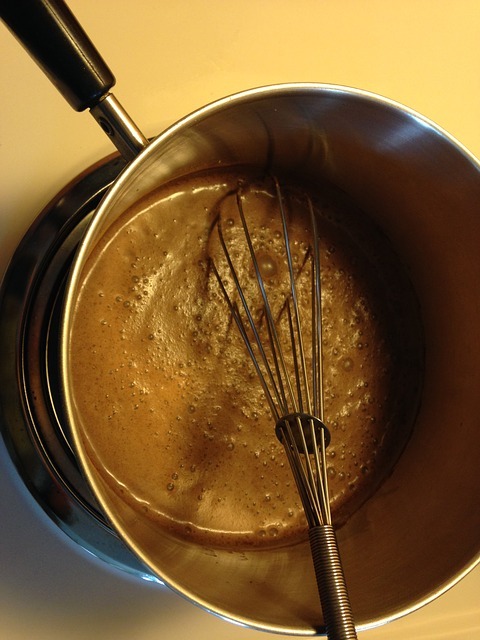 Scout reports, “Miss Maudie baked a Lane Cake so loaded with shinny it made me tight.” Probably because there’s somewhere between 1-3 cups of bourbon, just depends on how you feel some days. Lane Cake is made from four layers of white sponge cake that are slathered in between with a mix of egg yolks, butter, sugar, raisins and bourbon. The frosting was the old-fashioned boiled variety of whipped egg whites, which most people now simplify with modern conveniences. In a large mixing bowl, cream butter, sugar and vanilla. Add egg whites, in four additions, mixing thoroughly after each addition. 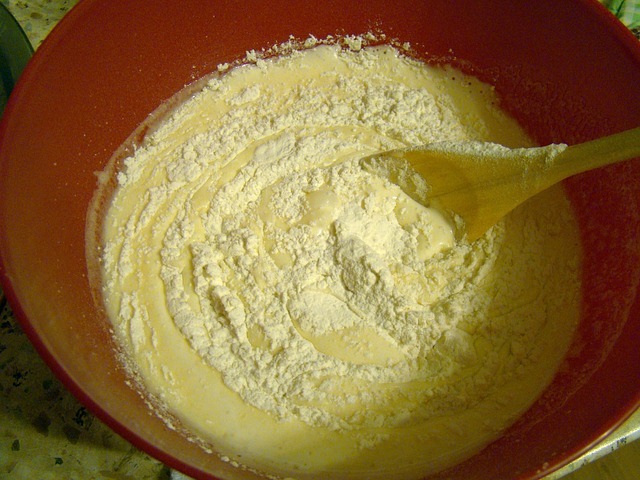 Fold in flour mixture alternately with milk. Begin and end with the dry ingredients. Batter should be smooth, but look somewhat granular. Pour evenly into four buttered 9 inch round layer-cake pans lined with parchment paper. Bake until edges shrink slightly from the edges of the pans, or a cake tester comes out clean (approximately 20 minutes). Cool cakes on a wire rack. To make the filling, in a 2-quart saucepan, beat egg yolks well, add sugar and butter. Cook over medium heat stirring constantly until thick. Remove from heat, add raisins, bourbon and vanilla. Cool slightly before using. Get ready to assemble the cakes. Place cake the first cake flat on a cake plate, top with filling – DO NOT SPREAD filling. Top with next cake, add filling. Continue this process until you have all four cakes carefully stacked. 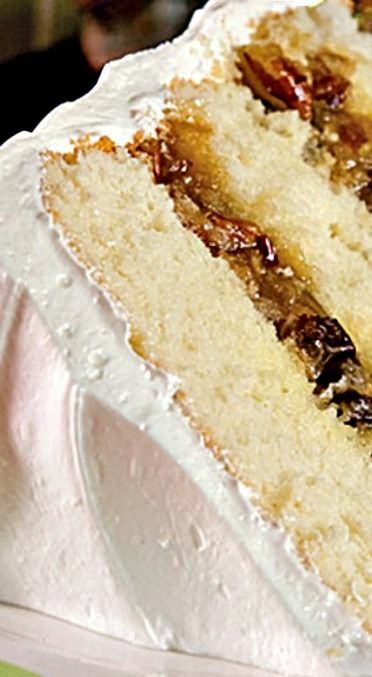 Save some of your filling to add to the top of your cake (optional). Once cake is “built” frost with a standard boiled frosting (which is what the original recipe used) or use a nice buttercream with a hint of bourbon. Cover cake, place in refrigerator for at least 24 hours. Bring cake to room temperature before slicing for better cake texture. Fold in flour mixture alternately with milk. Begin and end with the dry ingredients. Batter should be smooth, but look somewhat granular.Pour evenly into four buttered 9 inch round layer-cake pans lined with parchment paper. Bake at 375* for 5 minutes then turn oven down to 350* until edges shrink slightly from the edges of the pans, or a cake tester comes out clean (approximately 20 minutes). Cool cakes on a wire rack. Get ready to assemble the cakes. Place cake the first cake flat on a cake plate, top with filling - DO NOT SPREAD filling to the edges. Top with next cake, add filling. Continue this process until you have all four cakes carefully stacked. Save some of your filling to add to the top of your cake (optional). Once cake is "built" frost with a standard boiled frosting (which is what the original recipe used) or use a nice buttercream with a hint of bourbon. Cover cake, place in refrigerator for at least 24 hours. Bring cake to room temperature before slicing for better cake texture. I added the pecans, coconut and raisins to the food processor and processed until finely chopped. We sure hope you give this classic Alabama famous Lane Cake a try. I’ve got ours in the fridge now. We want to see your Lane Cakes! Please share them with us!